Hi there, so glad to have you here. 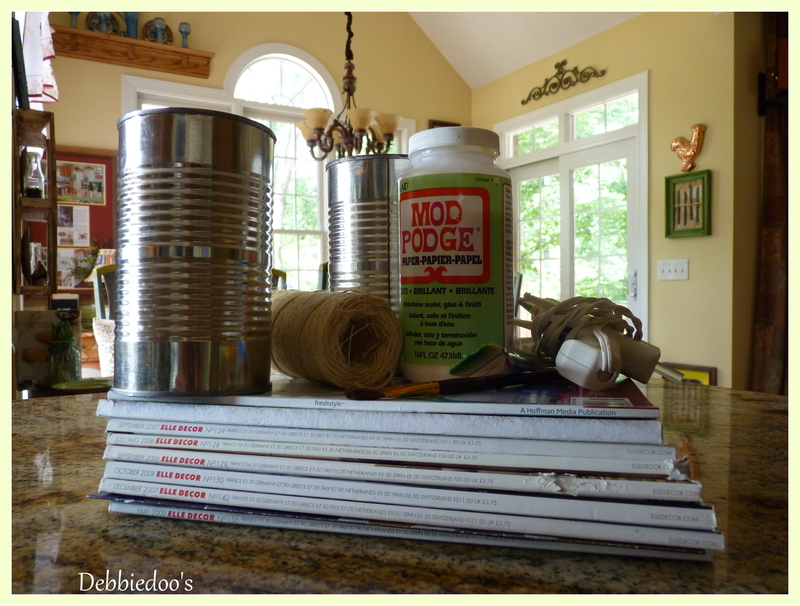 Today I am sharing upcycled mod podged cans. Soup cans to be exact. 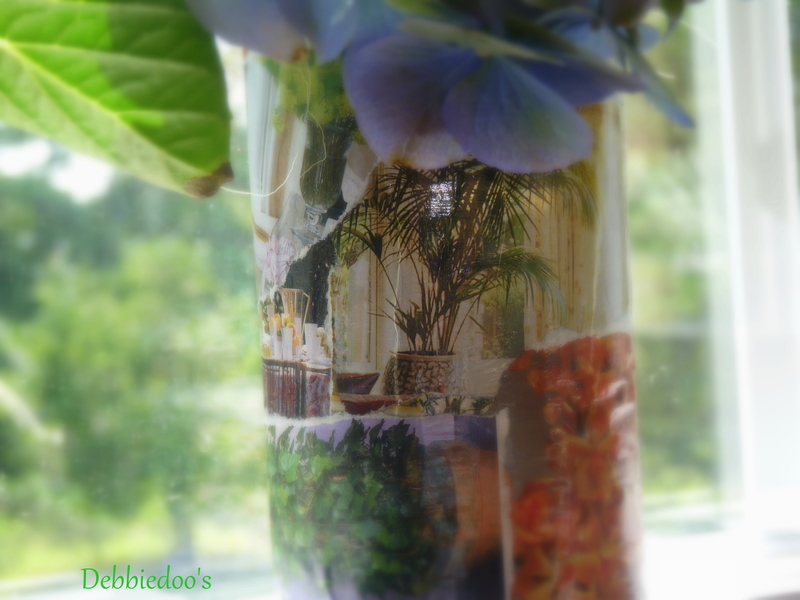 If you have never used mod podge yourself, I would say give it whirl! It’s fun and really quite simple. Started with some simple supplies. you remember my sweet Birthday present from a dear friend back in April? I have not killed it yet. What I have learned is hydrangeas love Water and they love sun. So I kept her well watered and near my kitchen window. 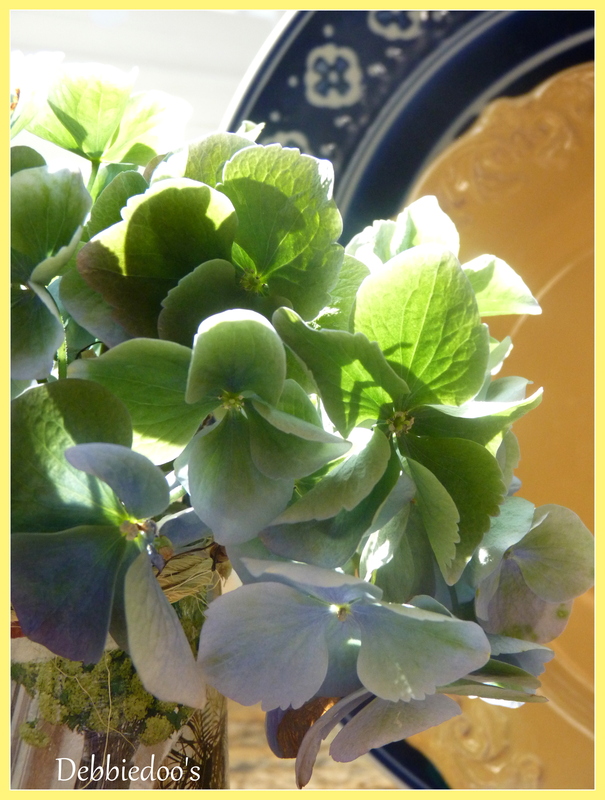 Pretty variations of green and blue..my favorite colors…oh and I love yellow too of course! I suppose you wanted to see the cans! I thumbed through to find mostly garden and flower pictures. It is summer after all. I had fun playing around as to where to put these cans. They looked pretty in both place. I mostly tore the pages…I only used scissors to cut my twine. As you can see I wrapped the top of the cans. I sure said the word CANS a lot in this post. too lazy to go and edit..at least I spelled it right. I always forget to tell you all that I am on facebook, and I love to chat it up over there! Come chat it up with me. Those are really cute cans! Your hydrangeas are so pretty. You have them inside? I never thought of having them inside before! Your cans look beautiful. I love decorating with cans as you know. Super cute and so summery!! They look so pretty sitting on your window! thats adorable and so summerish.. umm is that a word..
I’ve been meaning to ask you about the type pf plate holder you use for the 2 plates. I love that soooooooooooo much.. would you mind sharing? you may have already and I missed it. Can you believe that I’ve never decopauged anything? I guess I’m the only one! Ha! It looks like it’s fun to do. Your “cans” (ha!) turned out great! They make such cute vases for those flowers. You make the simplest things look good, Debbie. You have such a knack for that. These are darling Debbie Dear! Your hydrangeas are gorgeous! Great job!! Looks wonderful and you surely can not beat the price. When you have a chance, please stop by and see my faux brick patio concrete floor!! So cute Debbie! I haven’t played with MP in awhile either. I should try it again. These turned out so cute! You’ve got great cans!! If you’ve got them, flaunt them! Glad your hydrangea is thriving!! Those cans are Ka ute! I have not mod lodged in a while. I wish my blue hydrangeas would stay blue, but they are turning a pale green on the bush. Thank you for hosting! Sorry… my picture cropped awkwardly so I am sending through another. I do want to do something with mod podge soon! Just have never done it, like haven’t done spray painting and can’t get myself to try it yet! I want to glue twine around a tall cream colored fat candle for my beachy look. Thanks for the inspiration. 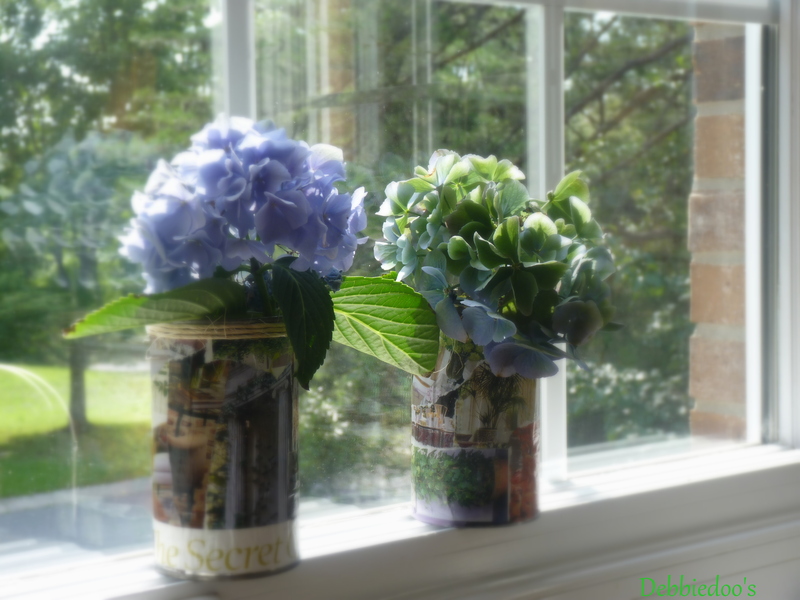 Oh Debbie, you know how I love hydrangeas….I love the mod podge can vases….Great idea to use cans…I would have never have thought to do that….again, you are the creative one! !….They turned out terrific!..Love them! 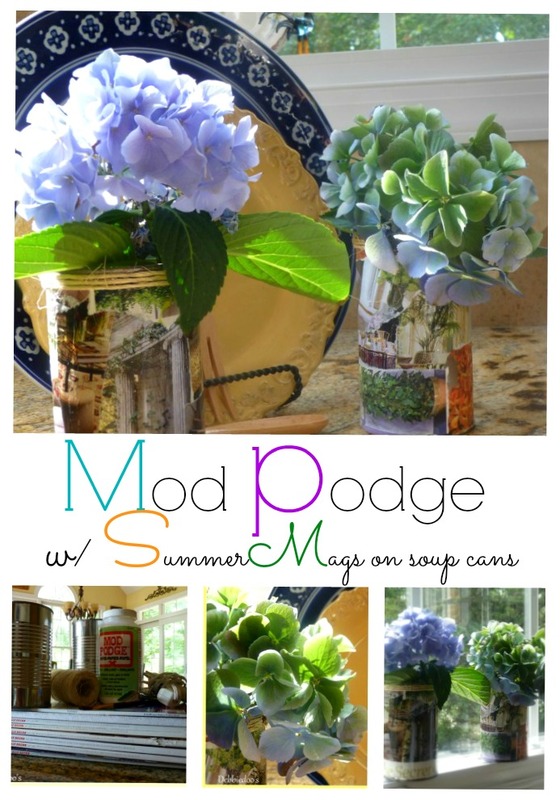 Oh, girl, I LOVES me some Mod Podge but I always say modge podge–can’t help it. I especially liked your recent shoe form and last year’s Halloween decor (because I love Halloween) projects you did. We should get together and cut and glue some time! Your cans look great. I’ve been playing around with a little modge podge too. Fun stuff! Debbie, Thank you so much for hosting this party for us “newbies!” It is such a great opportunity for us to meet one another and to get our little blogs out there in the big blog world! 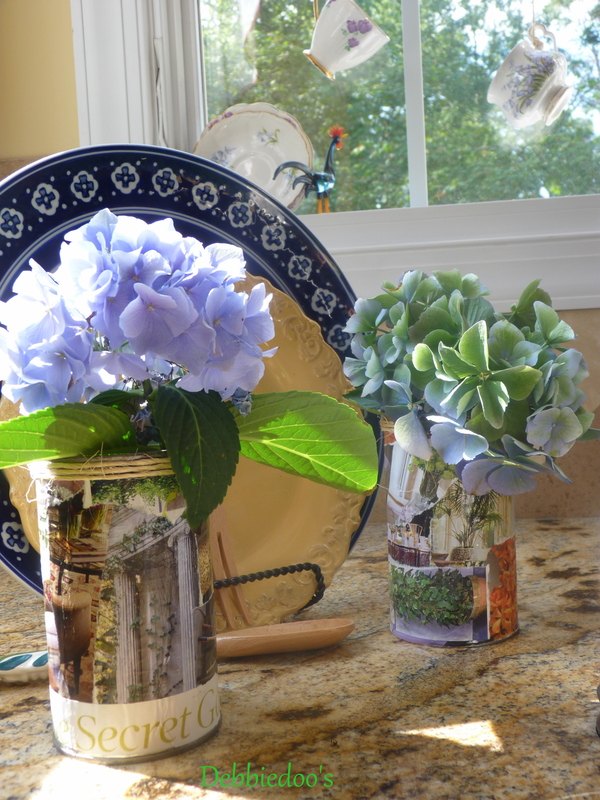 what beautiful cans, such a great idea and limitless resources for materials, your hydrangea is lovely! My favorite flower, they dry so beautiful as well, just spray them with hair spray after they dry and they last for ever! I have never mod podged…..Can you believe that? I think I need, too. 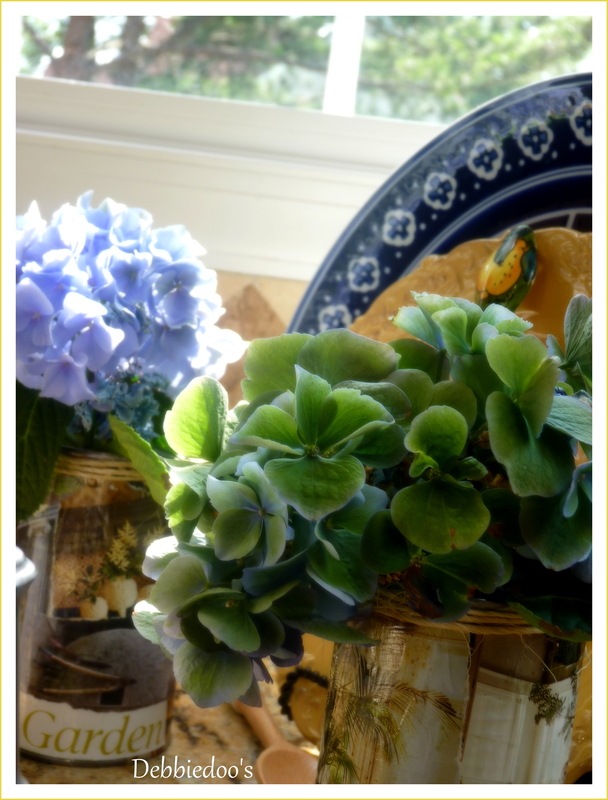 Love the cans…our Hydrangea’s haven’t bloomed yet! I can’t wait though to clip a few and bring them in. Happy Monday! Super cute! Debbie you are amazing. Love the hydrangeas. I just tried to link up as a newbie, not sure if it went through or not, mu computer is having hiccups today and is not wanting to cooperate! If it did not go through, please let me know. Thank you! I thought Hydrangeas liked shade better? I’m so confused!!! Mine was getting sun & it died. Now those are just too cute!! Thank you for hosting. 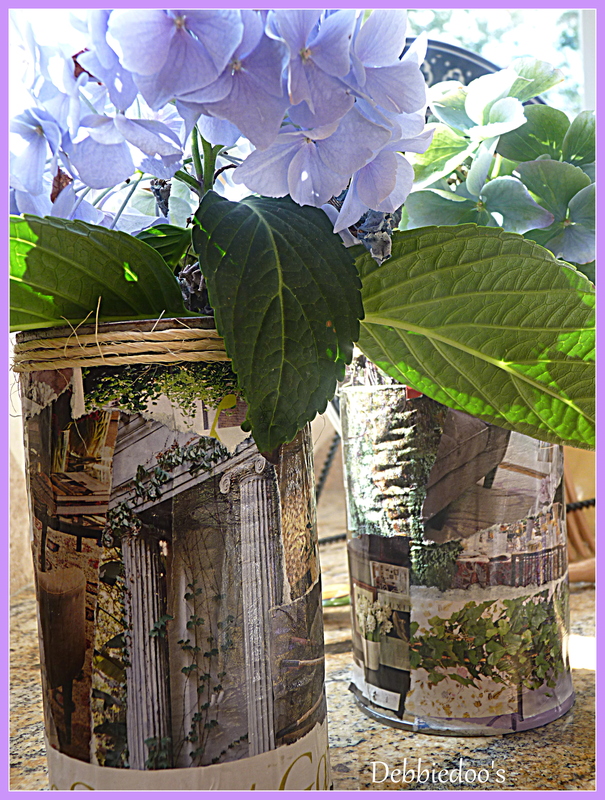 Hi Debbie; I think I could ‘copy cat’ your can/modpodge/gardenpictures flower holders. Your pictures are terrific. Thanks for hosting this week, I added Canada Day (bit early but it took forever to get the collages togethers, finding enough red/white). Thanks for hosting , Debbie and no, I have never used Mod Podge yet. I know I need to but what to make? thanks for the newbie….link from a newbie…..blogger lovin goil….love trhe mix of blue and yellow a very happy color…and yes blue on yur poarch ceiling . thanks for the explaination. My sis has a bungalow in a arts and craft style….beadboard ceiling in a soft turg tone blue…so happy in a wyo winter…. As usual, you are fabulous. Thanks for hosting your fantastic party! You are so impressive Debbie – I’m really not crafty – and have never used mod podge!!! Beautimous! Your cans are quite lovely! I love your hydrangeas! I never saw that pretty green variety! I’ve been bringing some in too, mine are deep purple. I just use vintage vases that I’m waiting to sell. but I did use white glue to decoupage the boxes that we display car magazines in at the car show. I will have to make some decoupaged cans, they are really cool! I love reading about you and your family. : ) Love these cans, reminds me of when I was a little girl. Thanks for hosting another week. I love my mod podge & all the crafty, wonderful things you can do with it. Your hydrangeas are truly stunning! I wish my thumb was green instead of black so I could grow such beauties. Maybe it’s all the paint on my hands. Oh well, a girl can dream can’t she. Thanks for hosting, I’m truly having such a great time mingling & getting to know everyone! Have a wonderful week. Oh I missed the party this week!! Darn! But I still can meet many newbies in this blogging world! What a great list you have this week!